Mystery Plays originated in a very simple form in about the 5th century, when monks and priests illustrated parts of the Gospel with songs and living pictures, especially at Eastertide. From the 10th century, they gained greater importance and were used at all the major church festivals, ordinary townspeople began to take part and the language used changed from Latin to the venacular. Round about the 11th century, in France, this form of dramatic worship came to be used toillustrate other scriptural subjects, such as the miracles and parables. The mysteries so grew in popularity and they overflowed into the churchyards, and later, several plays were performed simultaneosly outside the churches, moving from street to street in the locality, so that, in effect, every street had its play. Craft guils were formed at this time, and each scene was acted by and paid for by a different guild. ie Craftsmen. The word mystery comes from the French and the Late Middle English, and is properly, mistery, meaning trade or profession. The Lincoln Cycle differed somewhat in that the plays were not performed as street pageants but were probably set in the round at the west frot of the cathedral, with space between the sets for the audience. It would also sem that only one guild, that of St Anne, was responsible for their production, which makes for a certain unity which other cycles do not have. Mystery Plays were performed until the end of the 16th centurywhen they seemed to have vertually disappeared- went out of fashion?– but during the past 20 years there has been a considerable revival and ever-growing popularity. 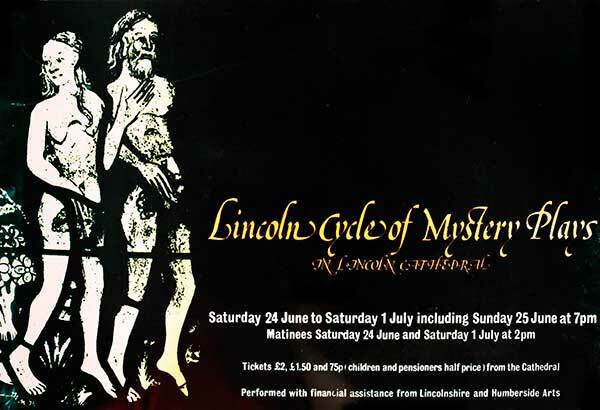 Te Lincoln Cycle has been performed in Grantham and Lincoln during this revival period and this latest production has for its setting, appropriately, one of the most splendid cathedrals (indeed some opinions would say the most splendid cathedral) in Europe. ‘Another piece of history was made this weekend in the city. A spectacular production of the Lincoln Cycle of Mystery Plays opened on Saturday- and lived up to the centuries-old tradition and all expectation. This was a mammoth production- in every sense of the word. Nearly 200 people were involved, rehearsals have been in progress since February- and the stage is Lincoln Cathedral. Quiet spoken director, Keith Ramsey, ought to be the proudest man in the city this week for his many hours of hard work have helped create an exceptional piece of theatre. Mr Ramsey is senior lecturer at Lincoln’s Bishop Grosseteste College, and college members and the Lincoln Cathedral Drama Association made up most of the large cast. The production lasts nearly four hours, and is honestly just too long to retain an audience’s attention and enthusiasm completely although everyone’s admiration was quite obvious. The cast overcame this beautifully. But ironically, because of the acoustics in the Cathedral, plus some poor voice projection, many of the elaborate speeches were lost beyond the first six rows. The costumes were some of the finest I have ever seen, both in design and make-up. Regald God (Jack Jones) with his silver grey beard and hair had a magnificent gold spiked head dress and a mask. Herod (John Challen) was in deep red, with Pilate (Douglas Ballard) in Roman blue and mauve. All credit must go to the costume designers Ann Etherington and Maureen Groom, and wardrobe mistress Mary Knox. The set, constructed in front of the choir, was stunning in its simplicity- a tilted horseshoe ramp, rising to eight feet in the centreand sloping down each side, depicting Heavenes Hill with God’s throne at its highest point. But all this would have been incomplete without some exceptionally creative lighting by Nigel Clarke, whose intricate special effects were breathtaking. Although the Mystery Plays are basically an amateur production, the cast was weighted by a few professionals. Ross McKim and Sue Little of the London Contemporary Dance Theatre were excellent in the dancing roles of Adam and Eve. The choreography by Ross McKim was stylised and energetic, and surprised some of the more conservative members of the audience. The part of Christ was convincingly and sensitively portrayed by Lincoln’s top actor Robert John Hewis, who now leaves the city to study mime in Paris. But the undoubted star of the show is another professional, Ken Bones, who gave a brilliant performance as Lucifer. The company also included Carole Baxter, Sally Cooper, Graham Rollins, Richard Hodgson, David Hodgson, Barbara Hodgson, Ian Hodgson, Mark Bright, Nigel Avieson, Sarah Sutton, Jane Hinton, Arthur Hazeldene, Clare Hazeldene, Sophie Ramsay, Sebastian Ramsay, Norman Goodchild, Paul Warwick, Denise Bellchambers, Angela McClaren, Sarah Knox, Rebecca Knox, Sian Phillips, Susan Phillips, Valerie Fane, Gregory Fane, Vanessa Fane.